Click here for a 2017 UPDATE! For €22 (or €11 if, like us, you find an offer through Groupon.fr), you have two hours to explore the gardens before a 15-minute fireworks+ display (I say “+” as there was an accompanying fire-throwing show!) which was also synchronized to music. We were amazed at the quality of the production—it was far better than anything we had expected. We certainly were not alone—the crowds could be annoying in some spots—but there is something about wandering the majestic gardens at night that made us feel like personal invitees of the King, or at the very least, characters out of a Jane Austen novel. And there were always calmer corners of the property in which to take refuge. Be sure to pick up one of the free maps of the gardens near the entrance. There are fountains and gardens that are a bit hidden, in particular down to the right just after the entrance, which you might miss if you are just wandering aimlessly (which I do recommend, just not for 100% of the time). The Fountains Night Show is every Saturday evening (9pm to 11:20pm) from June 18 to September 3, 2011. There are also special events from time to time on other evenings, most notably a Venetian Carnival evening on several Fridays in June and July as well as six grands concerts throughout the summer. On July 14th (Bastille Day), the gardens are open to the public free-of-charge for picnicking. There are also daytime fountain shows and concerts on summer weekends (click here for more information). A few logistical details: It’s best to purchase tickets ahead of time. 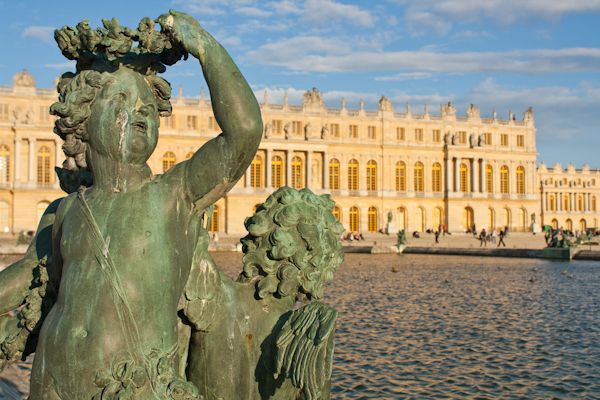 The château and grounds close at 6:30pm but you can still enter the first courtyard behind the château. At 9pm, the gardens open. We arrived just before 8pm and only waited about 5 minutes to have our tickets checked. So there is no reason to arrive much before about 8:30pm. They sell food in the gardens but there are long lines. There are also long lines for the few toilets available so… do what you need to do. No picnicking is allowed, but they do not specifically prohibit bringing food in the gardens (we snuck some fruit and sandwiches in). It does get quite chilly so dress accordingly. Unfortunately, it could be a bit of a miserable experience if it’s raining. You will benefit much more from the evening if you’re comfortable walking for the 2 – 3 hours you are in the gardens (I had to laugh at anyone wearing heels), but there are plenty of benches for those not as keen on an evening hike. For only €3.50 and about 30 minutes each way, the RER C (commuter rail) will take you from central Paris to Versailles Rive Gauche—Château, a 5 to 10-minute walk from the château entrance, or to Versailles Chantiers, a 15 to 20-minute walk. You can check train times here. We rushed to catch the last train back from the closer stop at 11:50pm (the fireworks show ends at 11:20 but there are crowds to battle, so even moving quite quickly, we only had about 8 minutes to spare). But I have since learned that the last train leaves Versailles Chantiers at 12:17am. There are buses to take you to the station if you don’t want to walk from the château at that late hour. 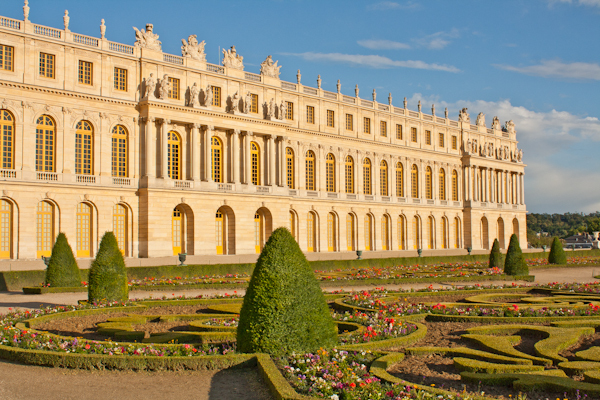 Whether you live in Paris or you will be in town just for a few days, take a look at the official website for events at Versailles and be sure to dedicate at least one evening this summer to this regal experience!